With so many different (yet similar) smartphones from so many brands from across the globe, one may start feeling a bit lost. Which one of those many is the best phone you can buy right now, in summer 2017? This is a trick question, of course. There is no definite one-size-fits-all device: some people prefer larger phones, some smaller, others look for the best camera in a phone, yet others value battery life above all, and then there are the gamers, the 24/7 music crowd, and on and on the list goes. That is why we look at different options rather than the one best phone. We look at both their pros and their cons because we have not yet encountered the perfect phone. We also look for your thoughts! That's why you will see an open poll for you to support your favorite device and if it's not on the list, let us know in the comments section at the bottom of this page. So with no further ado, let's get started. We first take a look at phones around the 5" form factor. Call them regular-sized, smaller phones, but these phones strike a good balance between screen size and handling. # Phone Added Change Why Should You Buy It? What is YOUR favorite phone in July 2017? The Apple iPhone 7 kills the headphone jack, but that's not the only reason why there's so much buzz around it. Despite featuring practically the same design as the iPhone 6s and iPhone 6, it adds some significant improvements in everything else: the new A10 system chip is much more powerful, the new rear camera takes better pictures in low light, the front camera takes much sharper selfies, the battery life is better, the screen now has more eye-popping color, the phone is water-proof, and there is now optical stabilization that allows shooting smoother-looking video. Did we mention that the pitiful 16GB base model finally goes the way of the dodo and is being replaced by a 32GB version? For $100 on top of the price of that base model you can get a 128GB version. Add another $100, and you get 256GB of storage, as much as on many laptops, and the most we've seen on a mainstream phone. Add to this the rich iOS ecosystem that continues to secure the best apps and games first, and one starts to understand why it's so hard to argue against the iPhone 7. Google is now a hardware company. Its first foray into the creation of a Google phone has resulted in the Google Pixel family. The 5" Pixel features a stylish, metal design and a clean build of the latest Android 7.0 Nougat with a promise for quick updates. The best about the Pixel is that it is one of the best (if not the best) performing phone out there and also one of the very best camera phones. Add to that a brand new focus on AI as the future and a fast and responsive Google Assistant, this phone shows a lot of what Google thinks a future phone would be able to do. The Samsung Galaxy S8 is in many ways a revolutionary new phone: it features a larger, bezel-less display that takes up nearly all of its front and is gorgeous to look at, it sports an even more refined design, and it has become more powerful and smarter with the addition of the new Bixby assistant. Yet despite its 5.8-inch display (keep in mind that you should not compare inch size directly with other screens, since this one has a different, taller aspect ratio of 18.5:9), it is not too big: it's taller, that's true, but its width is about the same as on the Galaxy S7 predecessor, so it is easy to handle in a single hand. The camera has received some improvements too: it shoots a little brighter images and seems to be able to get more definition in the details. The one thing where we don't have so much change is the battery: it is good, but not great or revolutionary as other parts of this phone. The HTC U11 might not have the fancy bezel-less screen, but it is a meticulously well-crafted phone with a beautiful glass back. The interface is clean and almost completely lacks animations, so the phone is indeed plenty fast, but without feeling particularly fluid. It's also packed with the latest Snapdragon 835 system chip, if that matters to you. Its best feature, however, might be the camera. The rear snapper is able to take some incredibly good looking images, with tons of details and beautiful colors. The LG G6 marks a new era for LG: less experiments with crazy designs and a focus back on the essentials of great design and performance. The new G6 is not a revolutionary phone, but it still has the extremely cool bezel-less screen with a new, taller 2:1 format. It has also improved its already very good cameras: now you have two 13-megapixel shooter for the dual camera system on the back, so there is no abrupt switch in the camera when you zoom in and out. LG has also improved battery with the G6 to good (but it's still not great), and coupled with nice software experience, the LG G6 is one of the best options for a new phone out there. The Huawei P10 is a beautifully designed, stylish phone for a price lower than that of 2017's flagships, yet with a similar level of performance and a very good camera. The bad news is that it will not be sold in the United States (at least initially), but it will be in all other parts of the world. Under the hood roars Huawei's own Kirin 960 system chip, which is indeed a powerful creation, and Huawei has improved the dual camera system. The idea is to be able to blur the background to images, a nice effect, but not quite as accurate as the Portrait mode on the iPhone 7 Plus. Still, it's nice to have and you get a secondary, black-and-white camera that gives you a different perspective to images. Our second category rounds up the best big phones: phones that are around 5.5-inch in size, giving you that larger screen, but in exchange for a more clumsy in-hand feel and larger overall footprint that makes them less comfortable to carry around in your pocket. What is YOUR favorite BIG phone in July 2017? The larger iPhone was never a better iPhone than the smaller one. The iPhone 7 Plus, however, changes that for the first time, Apple includes an impressive secondary camera only in the Plus model, and it has more RAM. And this is important: the secondary camera is a small revolution in smartphone photography, enabling much better looking portrait shots and giving users the option to zoom much closer in pictures while losing little in terms of image quality. Yes, the iPhone 7 Plus has no headphone jack (Apple says it's because it needed the space for more essential components), but in exchange it has gained water-resistance and a louder, dual-speaker system. The Apple A10 inside the 7 Plus is also a big improvement: yes, common users won't notice much of it, but go into image and video processing, as well as gaming and the gains are easily felt. Apple has also killed the pitiful 16GB storage option in favor of a much more sensible 32GB one, and there is a 128GB model and a 256GB version for heavier users. The only thing that still remains a sore short-coming of this otherwise excellent phone is its pure physical size: it's a gargantuan phone with huge screen bezels. 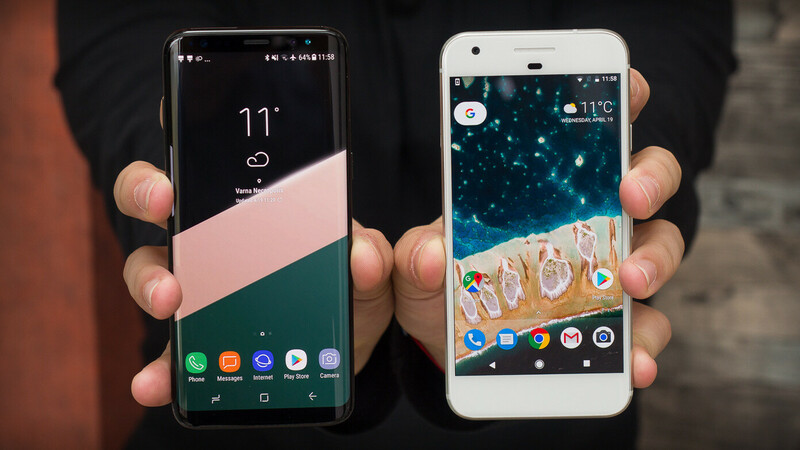 The Samsung Galaxy S8+ is the bigger of the two S8 siblings. Unlike Apple's devices, though, we have no huge differences here except for the larger screen and the bigger battery. The S8+ is the same beautiful, full-screen phone that display an outstanding level of craftsmanship. It also features a bezel-less, 6.2" display with a 18.5:9 aspect ratio (it's taller than a regular display) that looks gorgeous. The fingerprint is now on the back alongside the camera. The S8+ comes with a new interface and the brand new context-aware Bixby assistant. Google's larger phone, the Pixel XL, is a beautifully crafted device with a metal body, a slight chamfer that makes it a more comfortable in-hand fit, and it's also powerful on the inside. The big highlight of the Pixel XL, however, is without a doubt the stock Android 7.1 Nougat experience with the promise for timely updates in the future. It also showcases Google's idea of a future, where AI will be more useful and the Google Assistant that helps you with your searches is a peek at that. In many ways, this latest OnePlus 5 is an evolution over the OnePlus 3T and the 3: it does not make any tectonic shifts to the software experience, or anything else, but slowly builds up upon a successful formula. In real-life, it's not so much of a copy of the iPhone 7 Plus as it might look on pictures, but the influence is clearly there. The Dual Camera system allows you to take good looking portraits with blurred backgrounds, but nailing the shot right is hard and fiddly, and worse-off, the main camera might actually be worse than the one on the OnePlus 3T. It's good, just not quite there with the best. Apart from this, the OnePlus 5 delivers a solid daily experience: fast and clean interface, and battery that will last you a full day, even a longer one. The Moto Z2 Play looks a lot like its predecessor: it has a nearly identical design, (but one that is much thinner and lighter!) the square fingerprint button on the front and the large, round and protruding camera on the back. In fact, the Moto Z2 Play is the thinnest mainstream phone we can think of in recent history. But where it shines is battery life: you cannot get the full 2-day battery life that the Z Play got, but you will get close and this experience is liberating. The interface is also clean and pleasing to use and the price is not sky high. Did we mention it also supports Moto's cool Mods? The Huawei Mate 9 Pro is as beautiful as it is powerful. This state-of-the-art Huawei phone is even sold in the United States via Amazon. While not as advertized as Huawei's P series, the Mate 9 Pro is no less impressive. It provides the smooth performance of Huawei's EMUI, it runs on the company's own chip, the Kirin 960, that performs impressively well, and it's got a massive, 4,000 mAh battery. On the back, you'd find a Leica dual camera system that provides with some bokeh superpowers and as a bonus the phone supports dual SIM cards. The LG V20 is not really a mainstream device. It is built for power users, camera fanatics, audio enthusiasts, and content creators – for the mobile gamer, for the adventurous photographer, for the guy and his band in his garage, or for the hyped young YouTuber who just got his first 1000 subscribers. They’re the ones who would appreciate the full package of features that the V20 has to offer. Our third category is the best affordable phones. We have not set a price tag, but we look at phones that are easier on your wallet, without being easy in terms of features and actual performance. These are the overachievers of the phone industry. What is YOUR favorite AFFORDABLE phone in July 2017? The Moto G5 Plus is our go-to affordable phone for a number of reasons: its clean interface, its smooth performance and its surprisingly good camera. Did we also mention it gets great battery life as well? It does, and all of that can be had for just $230. Of course, it has its downsides. First and foremost, it's not the prettiest phone around by any means, so if you are looking for a flashy phone, this does not quite feel like it. The Honor 9 follows in the footsteps of Huawei's high-end devices, namely the latest P10 line, but cuts some corners to position it in a lower price range. Similarly to the Honor 8, the Honor 9 sports a glass and metal design that makes it a definite eye-catcher, though some people may find it a bit too garish for their taste. It features a dual camera configuration similar to the one found in the Huawei P10: a combination of a 20 MP black-and-white sensor and a 12 MP one that shoots in color. The Honor 9 is equipped with the very same Kirin 960 SoC found in the Huawei P10, as well as the Honor 8 Pro, which means you should expect more than good enough performance for pretty much all of your needs. Running inside the Honor 9 is the latest version of Huawei's home-grown Android fork, EMUI 5.1. This means what you're getting is as far away from stock Android as possible, with a huge number of features ranging from the essential to the entirely superficial. What most people would appreciate, though, is the ROM's focus on good performance. The Galaxy A5 (2017) is such an interesting device: it’s designed to near perfection with a stylish curved glass back and metal frame, and has the water-protection that only more expensive phones have. Apart from visual style, the A5 (2017) also has one of the better Android interfaces out there with the new Grace UI: it’s clean, it’s well-organized, it’s tidy. But the phone also has a few downsides: performance is not enough for more intense users, and it lacks 4K video and proper 1080p video stabilization. It's strong points are the impressive battery life, the feature-rich interface and excellent keyboard typing experience. Get it for the looks. Get it for the water-protection. It's not the best phone for camera enthusiasts, but for pretty much everyone else, it's a great choice. The Xiaomi Redmi 4 Pro is an excellent, super affordable phone that is extra hard to get. Xiaomi, a company based in China, officially sells its devices in Asia only, so in the United States and Europe you can find its phones solely via third-party resellers that charge extra and rarely provide any proper repair and other customer service. If you are willing to deal with that, the Redmi 4 Pro delivers in so many aspects: it's got a smooth performance, outstanding battery life, good enough camera experience (but no video stabilization results in very shaky footage), and a metal body. The phone is still a bit on the chubby side and its MIUI interface is rich in features and customization options and themes, but not particularly well adapted to Western realities. It's an adventure, that's for sure, but one we do recommend enthusiasts take. The Honor 8 is stylish, feels nice, and doesn't over-sell on features: the only thing that even threatens to verge into gimmick territory is the phone's dual cameras, and they just work so well that we can't find fault there. The EMUI custom interface is a huge step away from stock Android looks and functionality, and it does take a lot of getting used to, but it performs smoothly and is optimized to help get great battery life. The Lenovo P2 is the longest lasting mainstream phone ever made. The combination of its massive, unmatched 5,100mAh battery in a reasonably sized device will bring you back to the old times when you forgot to change your phone for two or three days, and it sill had battery juice left. It's a liberating feeling. The P2 also performs well: it features the Snapdragon 625 system chip, manufactured on modern technology, and it packs enough punch for smooth daily performance. It's not all roses, though. The Lenovo custom interface is plain ugly and feels quaint, nowhere near modern Android interfaces from Google, Samsung and the rest. The phone itself is also a bit bulky and relies on the old, microUSB standard for charging. Looking for something truly small? Our fourth category is for you, those who look for a phone they can use with one hand. One of the most unique things about the Apple iPhone SE is that it's in a class of its own: there is no other phone of such size that's even remotely as powerful. It's the only high-end, truly mini phone you can find on the market. There's something valuable in how easy it is to work with a smartphone of such caliber, without sacrificing much of the handheld power we've gotten used to over the last few years. But the iPhone SE is excellent in other aspects as well: its got one of the best cameras at its price, it gets all little things right, from the excellent call quality, to the smooth performance, and it comes with iOS with all the benefits of its stellar app ecosystem. At $400, the iPhone SE is also good value for the moeny. The Galaxy A3 (2017) is such an exciting phone: it brings a level of sophistication in design and interface that we have not yet seen on affordable phones. Neither have we seen a phone with water resistance. It’s not a phone without its flaws, though, so let’s list them all here: it’s a bit slow when compared to a flagship phone. There is a moment between hitting an app icon and the actual app starting, and while this is not a big deal, it is there and it is noticeable. It also does not have video stabilization, so videos do turn out very shaky and jittery. And yes, 16GB of on-board storage is too little these days and a 720p display is not perfectly sharp (but we could hardly tell any difference in real use). But these flaws pale in comparison with all the great things going for the new A3: its brilliant design is something that you will enjoy every single day of using it, its vibrant display makes images come to life, the new Samsung Grace interface is rich in options in a way that still feels organized and not overwhelming, its battery life is excellent and we get two days on average even with heavier use (but we do turn off the Always-on display option). And this phone captures very good looking images. The Sony Xperia X Compact delivers very well on most important fronts. It has a good camera with excellent focus-hunting abilities while video recording. The screen is also very bright and with low reflections, making it great for outdoor viewing. The battery life is top-notch, and call quality is loud and clear. These are all things most people are looking for in a handset, and when delivered in a small and handy package at a decent price, they make the phone stand out. Finally, our fifth category is for exotic phones. These are devices that are either hard to find or that go crazy with their features. The Mi 6 is the 2017 flagship for Chinese Xiaomi. It builds up on the successful formula: top-notch hardware for an affordable price. The Xiaomi Mi 6 is also an improvement over the previously released Mi 5: it features a much more solid design, it's got a brand new dual-camera system with a secondary telephoto lens, and it's got a longer battery life. All of that comes at a price of less than $500, which is certainly impressive. Xiaomi is a company that has been growing quickly in China, but that does not sell its phones in the United States or Europe officially. And that's a pity. It's Xiaomi Mi Mix is a limited-edition all-out crazy phone with a 93% screen-to-body ratio and a giant 6.4-inch display that fits in a body roughly the size of the 5.5-inch Apple iPhone 7 Plus. With a ceramic back that is very hard to scratch it also looks good. While currently the world is awaiting the 2017 Samsungs and Apples that will most certainly get this new bezel-less look, in China such a phone has already been available for months now. Sure, it's pricey at $800, and yes, it's only made for China, but your street cred would go way up if you can import this baby that will only work with AT&T and T-Mobile in the U.S. You'll definitely feel like you've come back from the future. The KEYone still isn't a phone for everyone. And at just about $550, it's still a little more expensive than we'd like it to be. But for the right user, it's just such an extremely satisfying phone to operate that all its missteps and eccentricities don't seem to really matter. This is a phone that knows exactly what it wants to be, and has no qualms in doing things its own way. That's an increasingly rare thing in today's homogenized smartphone market, and that TCL is able to do it so successfully with the KEYone is all the more impressive. The less extravagant, but equally cutting-edge in terms of style and looks Xiaomi Mi Note 2 is really something that you should know about. Like a close cousin of the discontinued Galaxy Note 7, the Xiaomi Mi Note 2 features similar curves and elegance, but does not explode in your hands. It's an extremely well-crafted phone, but unfortunately also one made only for Asia with its MIUI interface and other quirks. Still, if you want a phone that you can proudly show as a design masterpiece, this baby will work on AT&T and T-Mobile if you want to import it. Keep in mind that this comes with no warranties or proper service, though. Big in China, the Oppo R11 is in many ways the originator of the OnePlus 5. What do we mean? Well, it uses the exact same dual camera setup for starters and the same fast charge system. Oh yes, and OnePlus' office is one floor below the Oppo offices, located in the very same building. Still, the Oppo R11 is not an exact copy of the OnePlus 5: it features a different chipset and a slightly different look, but if you are looking for an exotic phone that is also good to use, it will definitely fit the bill. The alien design of the Honor Magic definitely qualifies it right in the exotic phones group. There is truly no other phones with a similar shape and curvature, so if you want a phone that will have everyone looking and wondering, the Magic fits the bill. It also runs smoothly in the daily grind, but can be hard to find outside of China. Xiaomi MIX Pros: "First bezel-less phone" So Sharp Aquos Crystal series isn't? What are your views to make you say it is not bezeless? Care to share? It's got a giant bezel at the bottom. Thank you for your reply. I understand where you are coming from and have the rights to your own view, They are both definitely worthy to be called bezeless devices though, in my humble opinion, AQUOS crystal has a much thinner bezel(not the chin, but left, top & right) is slightly thinner than the one's on Mi MIX, making it a more tasteful and immersive bezeless device. Oh, Sharp was the supplier for MI Mix screen in case anyone wonders how did XiaoMi manage to create such a device. But bezel-less has 2 definitions. Bezel-less as in having no bezel at all. Bezel-less in that is has less bezel than the models normally have. So as long as the phone fits one of those definitions, then its bezel-less. No matter what our personal opinions may be. If a phone for example has a 70% screen to body ratio, and now has a 85% screen to body ratio and is of similar size. Then that means the phone has "less" bezel and thus meets the criteria for a "bezel-less" design, There is no "not really". It's either it is or it isn't. According to GSMARENA, both of these Sharp models, had a 77% screen to body ratio and thus would qualify as a "bezel-less" design because it had less bezel vs many other phones in the same year or period as a matter of fact. http://www.gsmarena.com/compare.php3?idPhone1=7251&idPhone2=6590 We don't did to play on words to fit personal vendettas. The Sharp Aquos qualifies as a bezel-less design, even if it was not marketed as such. You answer should have been fair and accurate as -"UHM, yes really". Because, yes ummmmm it really is a bezel-less design. No, bezel-less has one definition and it's "without a bezel". Everything else is fairy tale stories. Please explain how, under Best Affordable, the Honor 9 shows as added Oct 2016, but is labeled New, and the Moto G5 Plus was added April 2017 and is not New? And the Galaxy A5 (2017) shows as added Oct 2016 and is New? The Honor 9 was released last month, so obviously the date that's showing up there is a mistake. Right. PA's news is getting more and more unreliable these days. Thanks for mentioning all of those! The original idea with the added field was a bit confusing, so I have changed the concept to mean release date for the phones. I have just fixed and double-checked all dates, all should be good now! Thanks for noticing that, jellmoo! It should have been there, but we've already opened the polls, so I will just leave it there for the time being. Next month, it will be in its proper place. I liked how each category started with Apple iPhone ... Nice job. That's just our thoughts! We have included polls for this very reason and we're looking forward to seeing what you guys vote for! I want a compact smartphone with a large screen. That was not more 130x70mm and with a screen 5.5"
So according to PA Android phones do not have great apps? Yet Android apps have features IOS gets years later and are praised to the heavens by iFans. Some of the best apps do not even appear in the Apple store. iPhones does not have class leading performance, they may be fast, but have inferior screens, cameras and battery packages yet have outdated, outsized and heavy bodies for the screen size. I can't speak for the whole PA team, but while there are many quality apps on Android, it feels like iPhone apps in general are better executed and offer more functionality. And when it comes to games, the iPhone gets the best newest games earlier and often exclusively. I agree with you 100%. FACT - IOS apps use a better quality code. Adjective C is a better code platform vs Java. But its up to the dev to provide the quality of the app itself. Because there are plenty of crappy iOS app. In fact just as many as there are on Android But facts are when you compare 2 exact apps on iOS vs Android, an I mean apps that are highly downloaded and used, iOS apps do not have more features, they have different features. Some yes have some better features, but that is true on both sides. For all the apps I use on my Galaxy and the same app where available on IOS, the quality of both is very identical. Several I use, especially my banking apps on Android, off extra thinks not offered on IOS. Even games. For example, my kid loves Pokemon Trading Card Online. But Apple has blocked the ability to add cards you buy at the store. Example, I buy him cards from Target. Inside the pack is a card that allows you to add the items online. Apple blocked this so he cant add cards through the iOS app. Apple did this because Apple doesnt get a cut of the buy. But they are bought at a retailer. But on Android we can add and even use the camera to scan the car to add them. Other than this feature, the apps are 99.9% identical. Victor's claim is simply untrue as you stated and complete BS. I dont care what platform you prefer. I have no issue with anyone choice. But when you lie and make claims that are purely false for some agenda or a paycheck, then I have no respect for you. The biggest difference in apps that both platforms share, is what Apple allows and what they don't. Android apps in general offer more because Google has less restrictions. Another example is the Samsung Gear Manager. Apple blocked several of the Gear Manager features so that the Gear S series, can do less with the iPhone vs the Galaxy. Example, even though app allows the devices to update certain things like the weather, it will to this day not show the weather on my Gear S3, when I have it BT'd to my iPhone. I contacted Samsung about it more than once and the issue resides with Apple. We love hearing your thoughts! The Galaxy S8 is a great phone, and there are quite a few reasons to get it over the iPhone. There is no one-size-fits-all phone. Yet, you cannot argue with numbers and the iPhone is the best selling phone by a large margin. I guess being the best selling phone makes it the best phone. Just like being the singer of the best selling song makes you the best singer in the world. That is why Justin Bieber is one of the most talented singer of all time, ahead of Aretha Franklin by a huge margin. I have the s8 plus g955fd, sony xperia xz permium, pixel xl and a 7plus. I personally find the xz to be the fastest phone (times faster than the iphone watch for the speed test on youtube).. pixel has the best camera, iphone has the largest storage but s8plus is the best coz it's the most complete package, along with having the best display - and hence my primary daily driver.